Bienville Studios is a small design house in New Orleans with a passion for machinery. Some of their designs are before their time, like the CNG powered Magnolia Special. Others can be said their time has come, maybe a long time ago, like the new Bienville LeMat revolver. 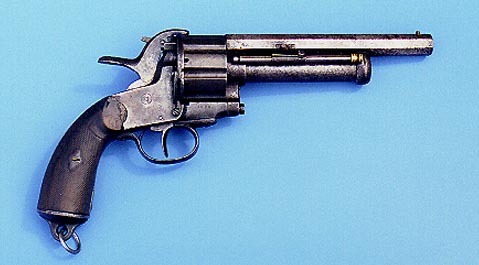 The LeMat revolver was popular during the American Civil War. It was a percussion revolver with 9 shot cylinders that usually fired .36 or .42 round balls. The difference was there was also a center barrel smooth bored for buckshot, usually 20 gauge, which also gave the gun it's nickname, the Grapeshot Revolver. The user can flip a switch on the hammer to select the shotgun or standard barrel. The gun was invented by a New Orleans native, Dr. Jean Alexandre LeMat, and was used by such notable Generals as Stonewall Jackson. The gun was made abroad as no facilities existed in the South to build such a gun. LeMat revolvers have been reproduced by the Italian gun industry, but the LeMat connection was a natural for Bienville studios to redesign the gun, as they relish their New Orleans heritage. The gun is a break open design, ala Webley, and can use almost any centerfire .38 cartridge you can think of, with the possible exception of .357 SIG. The center barrel chambers 20 gauge shotgun shells. It's a nice reinterpretation of the original. It's not immediately apparent if any of these new LeMats have actually been built.